L-R Atty. Minnie Lopez and Atty. 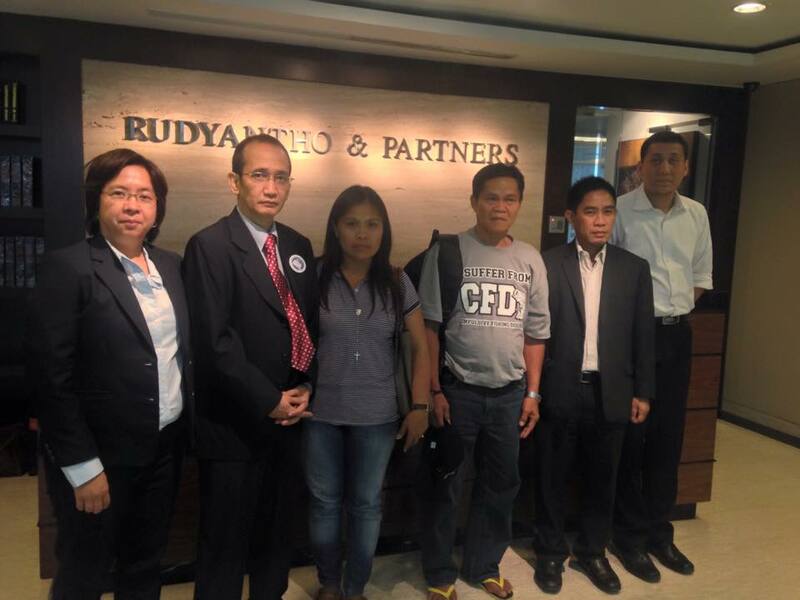 Edre Olalia of NUPL, Maritess (sister), Cesar (father) and associates of Rudyantho & Partners Law Firm. Jakarta, Indonesia, April 22, 2015. Lies upon lies upon lies were revealed after Mary Jane Veloso’s Philippine legal team met with her Indonesian lawyers, Rudyantho & Partners (R&P), in Jakarta a day ago. The PH legal team, led by Attys. Edre Olalia and Minnie Lopez of the National Union of People’s Lawyers (NUPL), held a dialogue with R&P in the presence of Mary Jane’s father, Cesar, and sister, Maritess, and Migrante Sectoral Party chairperson Connie Bragas-Regalado. The PH legal team is still in Jakarta now to coordinate with R&P on the appeal for Mary Jane’s case. It is NOT TRUE that the PH embassy provided Mary Jane with legal counsel and assistance “from the very start”. R&P made it clear, through its associate Atty. Agus Salim, that the PH embassy only availed of their services on the appeal stage. Prior and during the trial, a court-appointed lawyer, similar to PH’s Public Assistance Office (PAO), represented Mary Jane. A few years back, R&P had already requested the Aquino government to investigate Kristina “Tintin” Sergio, Mary Jane’s alleged recruiter and trafficker, even BEFORE the filing of the first petition for judicial review. This would have been instrumental for the appeal. They were, however, dismayed to learn that the PH government only attended to this AFTER the judicial review had been rejected by the Indonesian Supreme Court on March 25, 2015. It was only on April 16, 2015 that Mary Jane’s parents, through their NUPL lawyers whose pro bono services they acquired only on April 7, 2015, were able to file a letter-complaint against Sergio at the National Bureau of Investigation (NBI), PDEA and Inter-Agency Council against Trafficking (IACAT). A certification from PH authorities, officially translated to Bahasa, is crucial to support the filing of the second judicial review. PH lawyers are still waiting for said certification. It was ONLY LAST WEEK that the PH Embassy gave R&P the official translations of the first and second verdicts on Mary Jane’s case. It was on October 11, 2010 that the District Court of Justice of Sleman in Yogjakarta sentenced Mary Jane with the death penalty. The Court of Appeals of Yogjakarta upheld Mary Jane’s death sentence on February 10, 2011. The Philippine Drug Enforcement Agency (PDEA), supposedly in aid of plans to submit a second petition for judicial review, submitted to the PH Embassy a report based on Mary Jane’s testimony after its visit with her last March 29, 2015. The PDEA report is in English and R&P was only provided an official Bahasa translation yesterday, April 23, 2015, almost a month after the PDEA got Mary Jane’s testimony. PDEA is yet to coordinate with its Indonesian counterpart, the Basan Narkotika Basional (BNN) for the comparison of the results of their respective investigations. Both R&P and the PH legal team are yet to be provided with the reports. The Aquino government claims that Mary Jane’s execution is not imminent until all appeals of the Bali 9 have been duly resolved, this is NOT TRUE. R&P made it clear that the pendency of the Bali 9 appeals will not have a bearing on the implementation of her death sentence, hence the urgency for the PH government to provide them with all necessary documentation. “These are the facts. Ang katotohanan ay walang ginawa ang gobyernong Aquino sa kaso ni Mary Jane, kaya nagkukumahog sila ngayon. Nasa bingit ng kamatayan ang isang inosente nating kababayan dahil sa kapabayaan at kawalang-pakialam ng gobyerno. Hindi ito bago. Ganito rin sa lahat ng mga OFW. Ganito rin sa Mamasapano. Ganito rin sa Hacienda Luisita. Ganito rin kay Jennifer Laude. Ganito rin kay Kristel Tejada. Ganito rin sa lahat ng Pilipino,” said Garry Martinez, Migrant International chairperson. Martinez called on all supporters of the #SaveMaryJaneVeloso campaign to hold the Aquino government accountable for criminal neglect on Mary Jane’s case.